Things can be a lot more fun than just lazing on the beach sipping cocktails or enjoying the fabulous in-house facilities of your hotel. With the many sights to see and places to be explored, your vacation can also be a great adventure and to do this you will need to know how to get around. 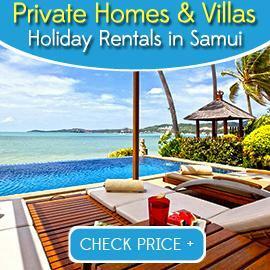 But fear not, because transportation in Koh Samui is well geared and inexpensive. All the island’s main roads are cement so you can travel safely, but dirt roads are still there for those ready to conquer them on off-road and quad bikes which are available for rent. 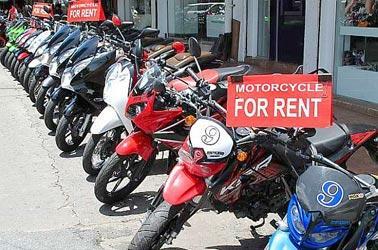 The most important message we have for you is that if you rent a scooter or motorbike is to be extra careful. The steep hills and winding roads can be treacherous, often covered in loose sand and not mentioning other foreign road users with no idea of how to ride the bike which they probably rented without a license. Two types of taxis are available if you like to relax in the back of an air conditioned vehicle. 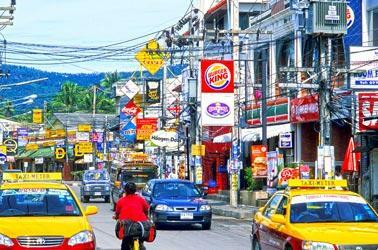 You will find the green and yellow or red and yellow taxi meters parked alongside main roads in Chaweng, Lamai, at the airport and in the vicinity of hotels. Walking along the streets you will have one offering a ride every 3 minutes. It is the more expensive mode of transport and drivers seldom negotiate on fixed fees. When the traffic is bad in places like Chaweng,keeping the meter off is anyway a good idea. The cheapest way to get around safely and charging a fixed rate is the Songthaews. These are basically pick-ups with 2 benches fitted on both sides of the rear, a canopy over your head and open on the sides. Apart from getting a feeling of more “island style original”, you could travel in one of these from Chaweng to Lamai and only pay 100-150 Baht for you and your partner included. It has a little bell on the roof which you just ring once you want to get off. Note they only operate until 18:00. Taxi scooters is a fast way of getting around, especially in traffic and even cheaper than the songthaew. Especially in congested traffic these guys will get you from A to B in no time. They are easily spotted wearing a vest indicating "taxi Scooter". 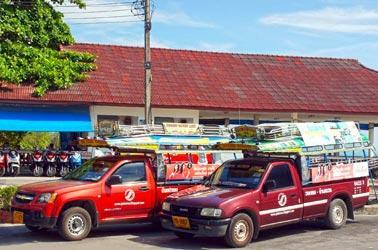 For 50 to 100 Baht these taxi's will take you the length of Chaweng Beach Road. Passengers are not legally required to wear a helmet, but we suggest you do. For 250 Baht you can have your own wheels for the day. Our advice is to make sure you wear a helmet, inspect the scooter before taking off and drive slowly. Many foreigners are involved in scooter accidents often due to driving too fast, under the influence or due to a lack of experience, so be weary of other road users and drive slowly. It is dangerous proven so by high injury numbers.